Ground Motive: A Ground Motive Symposium on Lambert Zuidervaart's "Religion, Truth, and Social Transformation"
A Ground Motive Symposium on Lambert Zuidervaart's "Religion, Truth, and Social Transformation"
Reformational philosophy rests on the ideas of nineteenth-century educator, church leader, and politician Abraham Kuyper, and it emerged in the early twentieth century among Reformed Protestant thinkers in the Netherlands. Combining comprehensive criticisms of Western philosophy with robust proposals for a just society, it calls on members of religious communities to transform harmful cultural practices, social institutions, and societal structures. Well known for his work in aesthetics and critical theory, Lambert Zuidervaart is a leading figure in contemporary reformational philosophy. 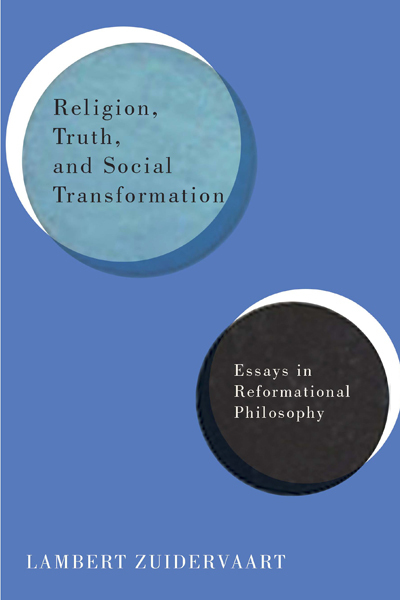 In Religion, Truth, and Social Transformation - the first of two volumes of original essays from the past thirty years - he forges new interpretations of art, politics, rationality, religion, science, and truth. In dialogue with modern and contemporary philosophers, among them Immanuel Kant, G. W. F. Hegel, Martin Heidegger, Theodor Adorno, Jürgen Habermas, and reformational thinkers such as Herman Dooyeweerd, Dirk Vollenhoven, and Hendrik Hart, Zuidervaart explains and expands on reformational philosophy’s central themes. This interdisciplinary collection offers a normative critique of societal evil, a holistic and pluralist conception of truth, and a call for both religion and science to serve the common good. Illustrating the connections between philosophy, religion, and culture, and daring to think outside the box, Religion, Truth, and Social Transformation gives a voice to hope in a climate of despair. *Essays in the final publication may not be exactly the same as essays linked in the repository. A great series, Ground Motive! I'm especially looking forward to reading DeMoor's response to "Science, Society, and Culture: Against Deflationism". Just one question: if any of the original essays are available as preprints or such online, could we have the links to them? It would be nice to be able to read what people are responding to. I don't think that would cut into book sales too much. Hello again, DZ. I've updated the post to reflect some of the links we have in the IR. Unfortunately we don't have the particular essay you're looking for, but our librarian is on the hunt for editorial permissions for the rest of these essays, so keep checking back as we'll update this table of contents with more links as they roll in. Thanks for the suggestion! Just an update on this. I've included links to all the essays we're able to link legally. The other essays have not been published before, so there's no way for us to make them available. However, the book will be released close to the end of our symposium, so hopefully especially enthusiastic readers could follow along, and engage retroactively with earlier posts. Thanks a lot for reading and for the suggestion, dz!